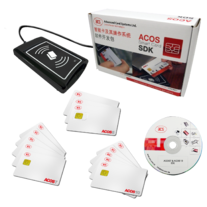 <strong>ACOS7</strong> and <strong>ACOS10</strong> Combi Card SDK (Software Development Kit) enables you to efficiently develop new applications and systems or incorporate the ACOS smart card into your existing applications that require Ministry of Construction (MOC) and People’s Bank of China 2.0 e-Purse and e-Deposit (PBOC2.0 EPED) specifications. The SDK’s technical documents, demo application, and smart card and reader tool offer both English and Chinese language support, to match the growing use of smart cards in China and in the Asia-Pacific (APAC) region, and to cater to the growing number of Chinese-speaking application developers. The ACOS7 and ACOS10 Combi can be applied to transportation, retail, property management, car parking, utility supply, etc.